On Friday and Saturday you will find a thriving set of food stall in Brixton Station Road. All sell food to take away but there are now some tables and chairs and the odd stool so you can sit and enjoy the sun. 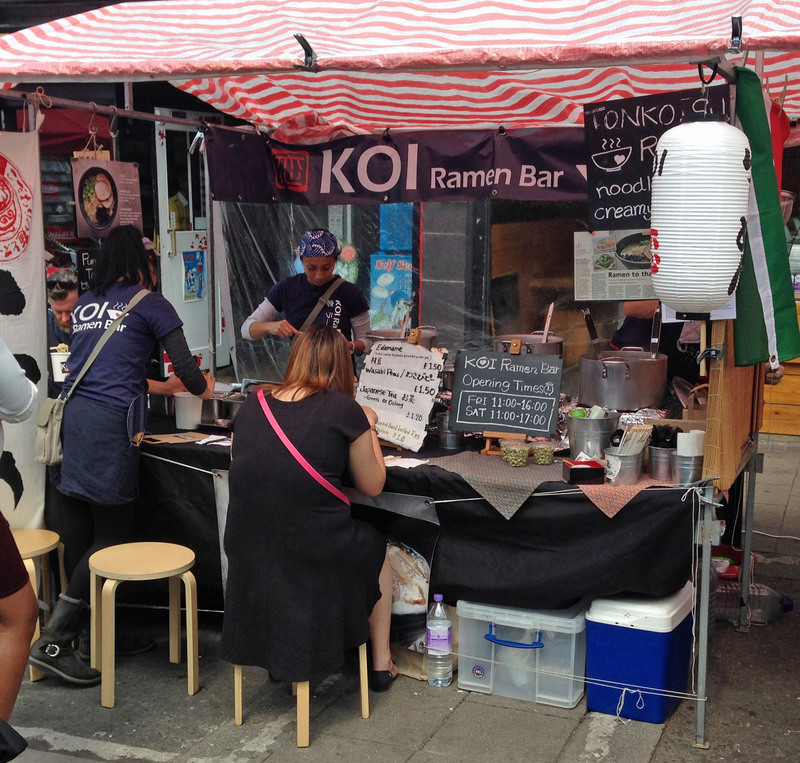 Finding ourselves a bit peckish and with the sun streaming through the clouds we decided to try out this stall – the Koi Ramen Bar. This is a Japanese Ramen bar with a limited menu – tonkotsu ramen (with pork) and yellow miso with vegetables and tofu. The food is served with chopsticks and a spoon out of large paper tubs and there are various tubs of things to add like pickled ginger, chili oil and sesame seeds. They ask if the vegetarian one can have egg noodles in it as they can produce a vegan option. We chose one of each sort and settled down while they cooked them and to watch the world go by. It was a particularly long wait as there was a long queue ahead of us so we were delighted to sit down. Soonish the large steaming bowls arrived but unfortunately our order got mixed up and two pork noodles arrived. So the wait for the vegetarian one was even longer. Both soups were full of flavour but the yellow miso was certainly our favourite. It comes with some fresh carrot, bean sprouts, and chopped spring onions on top and fried tofu throughout. They do come piping hot so you do have to linger or you burn your tongue. Unfortunately despite the heat the vegetarian one had noodles that were not quite cooked as this one had been a rush order. The staff offered me another and when I turned that down (I decided against another wait) they gave me back my money. But what I did eat was really delicious. They also serve green tea or oolong but these are cold drinks not hot. Here is semi-fast food without any possibility of regret that you chose the wrong one. Both kinds are good – just toss a coin. We spent £10.00 on two before they gave half our money back.